Dollhouse Miniatures by Felma J.: The Voice! My Encounter With A Third Kind Of Creative Juice! No Contest Winners! The Voice! My Encounter With A Third Kind Of Creative Juice! No Contest Winners! was the Voice Of God, although the voice sounded nothing like I imagine God's voice would sound. I sat upright in my chair and listened intently for the sound of footsteps. Maybe someone had gotten out of bed. No. That wasn't it. The voice was like a soft whisper of some sort, so I imagined it was female. It sounded comforting. I didn't have to wait long to find out because within the next two or three minutes I heard it again and at the same time a soft touch like a feather brushed against my right cheek. Naturally I thought it was a message from Heather, my chicken friend I killed for dinner when I was a young girl growing up in the country. Heather will always show me a feather when I am really in distress, but she has never touched me or talked to me. Since I was not really in the kind of distress that calls for a feather from Heather, I was still hesitant as started to lean back in my chair again when I clearly heard the word "Amour." At the same time I saw the mannequin I was contemplating on move slightly to my right. My mind started turning like a whirlwind and within hours I was almost done with the creation above. 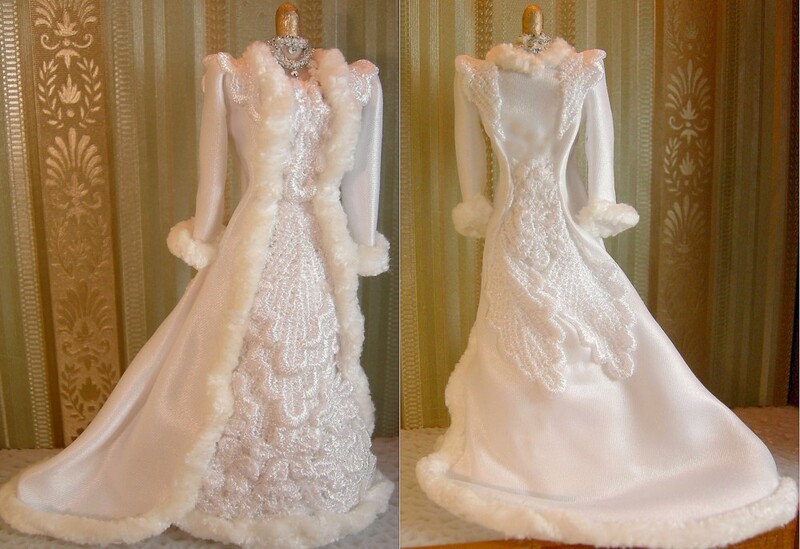 A Spring Wedding Dress, a Winter Wedding Dress. "Amour is the French word for love, an intense feeling of affection." Just one word can stimulate the creative juices to start flowing and you can let the juices flow forever as you listen for, "The Voice." Since this was my third encounter with a situation of this sort, I did not feel any fear. Only a peacefulness filled with joy. The contest for creating a doll is over and no winner was selected because there were no entries. Don't be afraid to open up and let your creativity flow. It doesn't have to be making a doll. It could be a creative walk or run or going barefoot in the park. You could take your camera along and stop to take pictures and share them with the world. Try this creative activity: Join my blog. Please leave positive comments. Of all the negatives going on, the positives going on is what keep us alive and balanced for another day. Grandson stops walking and climbs a rock to talk to a bear in the mountains today. I thought it was very creative especially when he named the bear Somite. I grabbed my camera just as the bear was running back to her cubs and grandson was waving goodbye with a smile on his face. What an unexpected adventure, although at two, he is already charming the ladies! Thanks again to all of you reading and following my blog. Love, hugs and kisses.